Last week my 3-year-old son had his tonsils and adenoids removed. What a stressful time for all of us! Even though this type of surgery is the most common one performed on children, any parent would still be worried about this happening to their own child. Apparently tonsils were removed willy nilly back in the day, but these days they will only take tonsils out for two main reasons. One of the reasons being recurrent tonsillitis, the other reason being difficultly with breathing. My son had difficulty with breathing because his tonsils were monstrous. As you can basically expect, the surgery went as normal. You’d think that a boy of his age would welcome the fact that he could eat all the ice cream he wanted, right? In this case, you’d be wrong. He didn’t want ice cream. He wanted ham and cheese sandwiches. What!!! Oh well, as long as he was eating, that was all we cared about. He’s back at preschool today, so it is time to get back in the swing of things. I realize I haven’t updated here in quite a few days, so here I am to tell you about these fudge brownies. This recipe comes from the same person who gave us those double chocolate cookies I posted about earlier. Those were lovely little gems. In the latest issue of delicious. magazine, Valli Little introduced readers to Mandy Valsinger, who used to own The Chocolate Maven in Sante Fe, New Mexico. 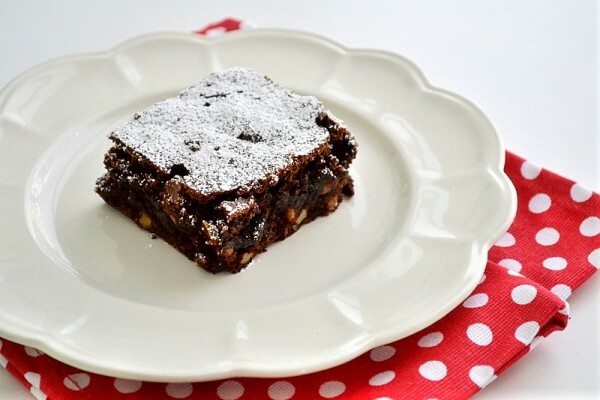 In the article, Mandy shares a handful of delicious recipes, one of which is the following recipe for fudge brownies (and the double chocolate cookies I linked to above). This recipe calls for 1 whole cup of cocoa powder, so make sure you use your absolute best cocoa powder for the ultimate chocolate flavor. I used Droste brand, which is Dutch processed. You’ll also see that this recipe calls for over 2 cups of sugar, so if you’re watching your weight, you’ll need to pass by this particular recipe! Sorry! Oh wow, so chocolatey, so fudgey, so delicious! The interior was perfect (which reminds me to note that you should not overbake these, or you’ll lose that fudginess), and the top had a lovely crunch. The recipe suggests dusting the brownies with icing sugar, which I did, but I imagine you could dust them with cocoa powder as well if you don’t want an extra hit of sweetness. These are perfect with ice cream. Just saying. 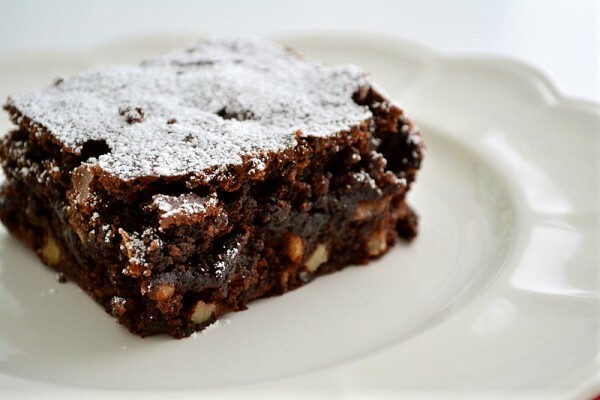 Fudgy chocolate brownies with walnuts. Preheat oven to 180C. Grease and line a 30cm square pan with baking paper. Combine chocolate, butter, cocoa and oil in a bowl over a pan of simmering water (make sure the bowl doesn’t touch the water), stirring until melted. Cool slightly. Meanwhile, beat eggs, vanilla, coffee and sugar in an electric mixer on medium speed for 10 minutes or until thick and pale. Fold warm chocolate mixture into the egg mixture until combined, then fold in flour and walnuts until just combined. Pour mixture into the prepared pan and bake for 40 minutes or until a toothpick inserted in the middle comes out with a few moist crumbs, but is not sticky. Cool completely in pan before turning out and cutting into 16 squares. Dust with icing sugar and serve. Ooo I love the walnut chunks=) I’m glad he’s feeling better! Getting my wisdom teeth out was the most miserable experience so I’m glad he recovered quickly! Mmmmm those look delicious … so moist and rich! Love the brownies! They sound delicious! Hope he feels better! I had my tonsils taken out and I remember wanting to eat food other than ice cream too! But I definitely didn’t mind eating it! aw so cute hope your boy is better! your brownies look delish! I’m passing on an award to you today…check it out on my blog! The brownies look so good.